I spend a lot of time improvising. Besides the daily requirements of a knowledge worker in our modern economy, I also teach and perform longform theatrical improvisation. In this art form, there is a very loose structure of acts that the performers simultaneously perform and create in front of the audience. There are “best practices” we practice and teach that enhance the experience for all involved, from the new player to the audience member. The core idea is “Yes, And.” If an idea is offered, it is accepted as truth and everyone builds on top of it until a world is developed. Each person on stage has as much say in that world as anyone else. It is built in a truly collaborative way; all participants are equally responsible for the outcome. Every offer is looked at as a gift, and the audience discovery happens at the same moment as the performer discovery. The process values intuition. acceptance, flexibility, and imagination. Del Close (the history teacher in Ferris Beuller’s Day Off), the father of this genre, tells us to treat everyone, including the audience, as “poets and geniuses.” The theatre that I perform in, that I helped build, was an adaptive reuse project. It was a small barbershop in Central Phoenix that we transformed into an intimate theatre that seats 33 people. In our space, the audience shapes every show because we can see and feel each person in this cozy space. As an improv community, we’ve had to develop a certain kind of resilience to the energy of a sleepy or generally low key audience at the top of a show—with some mixed results. Sleepy and low key shows are a snake biting its own tail. I broke away from a scripted performance background after years of working in that structure with a benevolent dictator in the director (and an absolute dictator in the playwright). I realized I was expending my energy towards another person’s vision, sometimes in a way that really clashed with my own thoughts and vision. Acting requires us to ask permission to perform: auditions, rehearsals, line notes, opening nights. The final goal is reproducing the rehearsed performance in a consistent way so that the Friday night patron gets the same quality as the Sunday matinee patron. It becomes a fairly rigid set of notes in the stage manager’s notebook in the end, and it is a transgression to deviate from this vision past the last tech rehearsal. The process values thinking, control, consistency, and precision. Masters of the longform improv craft bring precision and consistency to the work in a different way through deep listening skills, trust, and imagination. They never look out of control despite the fact they have no idea what will happen in the next second. In the best improvisations, the audience leaves saying “They totally cheated, they wrote that.” It looks like a script, walks like a script. It must be a script. It is an infuriating compliment to any group of improvisors. Hopefully they return an hour later to the next show and realize it is completely different. It would be impossible to write and refine the quantity of shows that are performed in improv theaters across the country. Both the scripted and improvised performance paradigms are great lessons in cooperative or collaborative work. The core difference is a focus on process versus product. Scripted performance is product focused: a refined, definitive end that can be repeated. Improvisation makes the process ultimately the product. The process is repeatable, while each product or outcome is unique. Our theatre advertises this as a feature: “It’s different every night.” Because of this, performer preparations are very different. Scripted theatre is a focused, detail oriented, discrete period of time. An actor can give too much of themselves to the project and will have some time to recover after the show closes. Longform improvisation is a marathon: every weekend there are new performances. It runs all year round. Stamina and a big picture awareness make it sustainable for an improvisor. 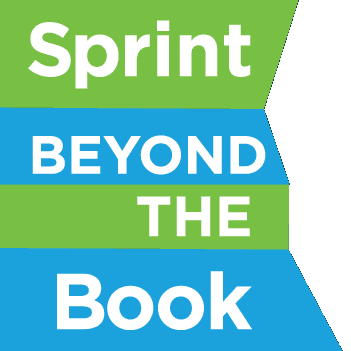 I found myself thinking a lot about this over the course of the three book sprints that make up our Sprint Beyond the Book experiment. I was charged with the content workflow and publication of the document, in whatever format was required for the particular sprint. The three events came with very different parameters, depending on the collaborators involved. The location and page number for each link, video, or image so they can be manually entered one by one in the platform. I developed a set of master pages in InDesign for the book layout, a template, and fed each article in to those pages as I received them. The template was designed for reading on a medium sized screen, like an iPad. It was meant to be viewed as single pages, not spreads, though it didn’t break if viewed otherwise. I had spreadsheets for the links and digital assets. My approach became very outcome focused, including rehearsals and demonstrations for nervous parties. The design was determined before the content existed, something I truly abhor as a designer. The system needed to be retrofitted to the content as the sprint progressed, making our goal of three publications during the process difficult to meet with the expectations of good typography, layout, organization of content, and imagery. The script broke. We published two incomplete versions on the platform. One complete version was retroactively published as a somewhat interactive PDF for download, using the same template designed for the original platform. The collaborators changed shortly before our event, which forced a decision to either start fresh or stay the course. We decided to stay the course with a minor shift: we would produce a semi-interactive PDF in addition to the website. The template was simplified for Microsoft Word, giving more people access to edit and change the document as it developed. The content was exported from the site as a collection for each writing-and-publication session (in our terminology, “mini-sprint”) with a tool built for creating anthologies from websites. This sprint had everyone in the same location, which made communication easier. This script broke this time as well. We published one incomplete version online during the event. A second incomplete version was published shortly before the third sprint, with “known issues” listed in the post. After the sprint was over and refinements became limited in Word, the content was brought into InDesign once again to expand the options for layout and typography. I have decided that I am not an expert in this: alone I don’t have the the best answer. My benevolent (or absolute) dictation has fallen short in the experiments. So I’m putting my faith in a purely collaborative process this time, one in which each participant is equally responsible for the outcome, where the process is the product. These documents are performative and living. The overall shape of the final product will change as the conversation develops and it will depend on everyone that is performing. I hope the energy of the audience will impact the development as well, just like if we were in a 33 person theatre in Central Phoenix. Terrific (and I really want to come and see your improv theatre.) Perhaps we need a new genre or product: a living book versus an entombed one. A fluid narrative in comparison to a pooled one (ref: Douglas Rushkoff.) I am reading this living book as it exists today, a narrative experience whose tone is similar to the one you read next year, but a different experience in itself.